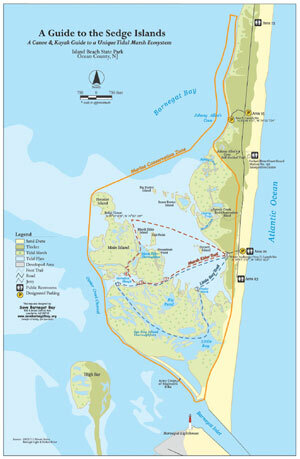 Visitors to New Jersey's Island Beach State Park can use this map to appreciate the park's diverse marine ecologies when navigating the Sedge Island water trails. Thanks to an innovative state and private partnership program, qualified nonprofit nongovernmental organizations (NGOs) and libraries in New Jersey are being introduced to the power of GIS. It began in 1995 when the state of New Jersey and Esri joined forces to help NGOs expand their GIS capability through access to state digital spatial data and ArcView software. Since its inception eight years ago, more than 170 organizations from all over the state have participated in the NGO program. Originally administered by the New Jersey Department of Environmental Protection, the program now resides in the state's GIS coordination program, the New Jersey Office of GIS (NJOGIS). Although natural resources-related projects continue to constitute the lion's share of incoming proposals, the applicant base is diversifying. Of course, one reason is that the power of GIS is becoming more widely recognized and supported. But another reason is that the NJOGIS is actively expanding the program to reflect the diversity of New Jersey's communities and their issues of concern. Following are some examples of how several of the state's NGO partners have used ArcView and other GIS technology to benefit their constituents, fulfill their missions, and help improve the quality of life in New Jersey. New Jersey's municipalities are experiencing a steady growth in their senior citizen populations, and the city of Plainfield is no exception. The Plainfield Senior Citizen Center is dedicated to providing onsite educational and recreational programs as well as counseling and other services to its more than 1,800 active members. However, the center also wanted to help the city's homebound seniors who were unable to get to the center. So, in partnership with the city of Plainfield and Plainfield Action Services, the center used its ArcView software to map where these residents live so that services could be delivered to them. Redesigning bus routes and coordinating the local Meals on Wheels program and other home-based services are ways that GIS has provided innovative solutions to meet the needs of Plainfield's changing community. Along the northeast corridor, wildlife habitat is competing with human habitat on a daily basis, and an alarming amount of migratory bird habitat has disappeared from New Jersey's landscape over the last 25 years. 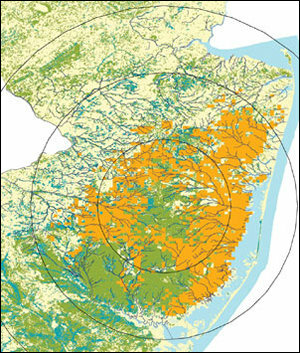 The New Jersey Audubon Society is integrating the latest in technologiesDoppler radar and GISto delineate important habitat areas for migrating songbirds. Because songbirds are nocturnal migrants, it is difficult to track their movements using conventional methods. Overlaying composite radar images with land use/land cover data in ArcView, biologists are able to identify areas where birds are resting and feeding by detecting the precise moment of liftoff. This data helps the New Jersey Audubon Society make its case for the protection of these important stopover areas. 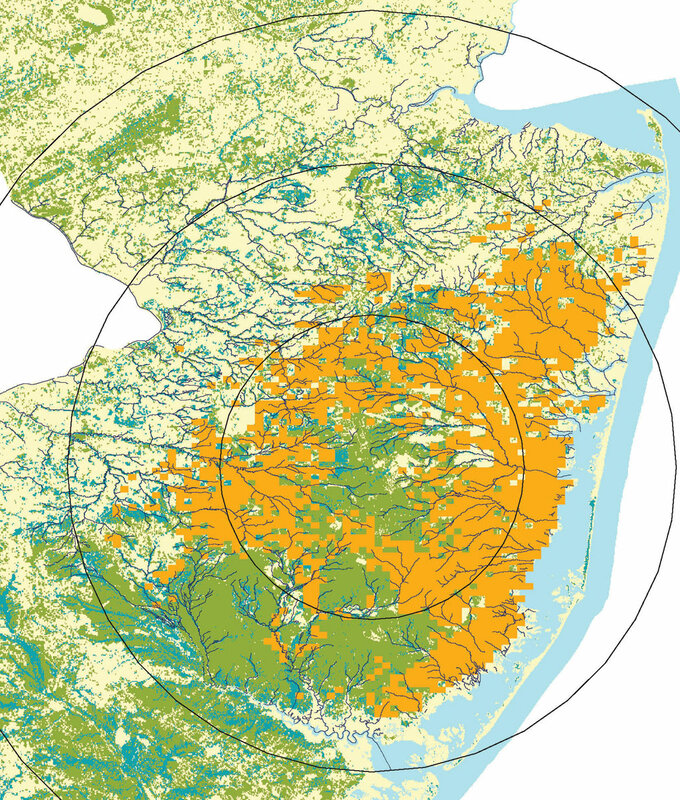 On this Audubon Society map, orange represents migrating songbirds detected by Doppler radar overlaid on forested wetlands (blue) and forested uplands (green) to delineate a critical stopover habitat in central New Jersey. Low-density development or "sprawl" brings with it a host of problems for New Jersey's communities including loss of open space, traffic congestion, and degradation of air and water quality. To counteract sprawl, local planning processes need to consider the impact of development on transportation and on public water, sewer, and natural resource systems before decisions are made. This is the philosophy of the Regional Planning Partnership (RPP), a nonprofit, nonpartisan, civic action group located in Princeton, New Jersey. RPP's Goal Oriented Zoning (GOZ) initiative supports expanding development in existing growth areas and optimizing natural resource conservation. Using ArcView, RPP developed GOZ, a GIS-based computer program that calculates the build-out impact of existing zoning ordinances and enables users to construct and test alternative zoning scenarios. We hear a lot about how New Jersey is the most densely populated state in the nation. But what we don't hear enough about is how local nonprofit groups are working to enrich the quality of life by helping to preserve and provide access to the state's extraordinary natural resources. Two such organizations, the Great Swamp Watershed Association and Save Barnegat Bay, both have used ArcView to create trail mapping through the unique geographies of their respective backyards. In Morris County, the Great Swamp Watershed Association is assisting the Morristown Environmental Commission's efforts to establish a section of the Patriots Path in northwest New Jersey that will link historic Speedwell Lake to the Morristown, New Jersey, transit station. This link will provide residents with opportunities for passive outdoor recreation and allow commuters and shoppers to walk or bike to the train for direct service to midtown Manhattan in New York City. Save Barnegat Bay has delineated and mapped routes through the Sedge Islands of Island Beach State Park on the New Jersey coast, making this marine ecosystem accessible for kayaking and canoeing. Both of these groups used ArcView to benefit their constituencies and help boost local tourism. After the North Camden Land Trust received a copy of ArcView through the NGO program, two dedicated staff members enrolled themselves in an Introduction to ArcView class. Then, because of the financial problems and time constraints that typify the day-to-day struggles faced by many NGOs, data collection was put on the back burner. Several months later, a group of students from the University of Pennsylvania's Urban Studies Department visited North Camden to learn firsthand about the Land Trust's efforts. One of the students negotiated an internship to help develop the organization's GIS capability by coordinating a group of volunteers to collect the data needed to map North Camden's neighborhoods. Information on housing stock, vacant lots, neighborhood parks, retail locations, and industrial sites was gathered and entered into databases. Esri technology translated the data into images that could be used by Land Trust staff to chart, map, and assess their progress in North Camden and then plan for tomorrow based on an accurate picture of today. A neighbor of the Land Trust, Hopeworks 'N Camden, provides computer training and work experience to prepare Camden youth for today's job market. When the North Camden Land Trust asked Hopeworks if it would consider adding GIS to its training curriculum, the proposal was enthusiastically accepted. The Land Trust offered to share its spatial data, and HopeworksGIS was born. Today the Land Trust's former intern is the director of HopeworksGIS, teaching local at-risk teens and young adults the basics and intricacies of GIS. Students collect data about building occupancy; infrastructure conditions; public transportation routes; and the locations of schools, churches, police stations, and businesses. The data is then converted into maps and tables and marketed to other nonprofit organizations in the Camden area. Trainees at Hopeworks are getting their GED high school credentials, enrolling in technical classes at Rutgers University and Camden County Community College, and applying for scholarships. For more information, contact Kathleen McGuire, New Jersey Office of GIS (tel. : 609-633-8910, e-mail: kmcguire@oit.state.nj.us).